The dormitory or hall of residence of the university will be the home of new students for most of the next four or five years. 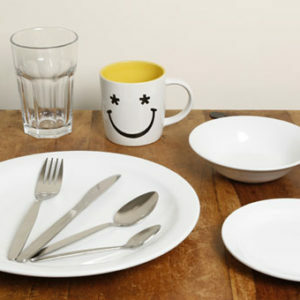 As moms and homemakers would agree, it is important that your home is equipped with the essentials you need for daily living, such as the tableware and basic cutlery set included in our student kitchen starter pack. Eating a healthy and proper meal is essential for any student to function fully and do well academically. Given this, it is important to make sure your young ones have the UK kitchen utensils set necessary to prepare and eat a nutritious meal. Having regular healthy meals and getting the nutrients they need will help boost their performance at the university and allow them to enjoy a holistic and well-balanced life. You can help them achieve this kind of lifestyle by providing them with a basic student starter kitchen set. The experts at In A Box have designed practical and high-quality kitchen starter packs that include all the essential tableware that will help guarantee students eat a proper meal everyday – dinner and side plates, oatmeal bowl, mug, drinking glass, knife, fork, dessert spoon, and teaspoon. The best way to guarantee they are following a nutritious diet on a daily basis is to complement their student kitchen set with healthy and easy to prepare meals, like oats, cereals, and soup. In addition to our UK starter set for kitchens, In A Box offers food gift packs that include meals and treats that can fill the nutrition requirements of hardworking students and help them up their game academically. Get an essentials pack for students now! Instead of worrying about how students will fare in their university life, equip them with the necessary tools for a comfortable and healthy lifestyle. Check our other sets of essentials for students and make sure you don’t miss anything!